We stopped for a quick visit with Santa at Macy's the other day. 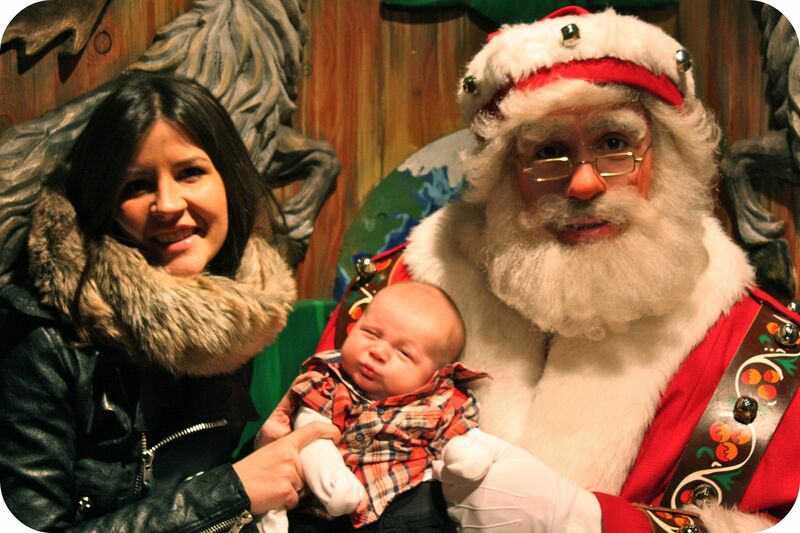 b) cuuuute picture of you w/ santa's helper! c) EGGNOG is the best holiday treat!!! christmas isn't christmas w/o A&E's nog w/ some cookies or a nice pumplin bar. mmm! erm. *pumpkin? idk what a pumplin is. I like egg nog, but I have to add some milk to mine since it's so ridiculously thick otherwise. I want to live in NYC! It sounds so amazingly wonderful- minus the finals of course. Hah! A first time commenter on your blog and the almost first post! My husband is working fulltime & taking his finals on top. Not fun for me here either. And oh, yes, I do love my egg nog - just straight up. I know this is scandalous, but I've never had egg nog or fruitcake! the prospect grosses me out. What type of evil class would make your husband berate you for taking your pants off in the kitchen? It's definitely not normal for a husband to complain about that in ANY room of the house. I just wrote a blog entry about finals. Mine will be done in 10 days. I still have 3 more semesters to go and for some reason I found myself looking up law schools last week. Seriously. Why would I want to go to law school at when I won't even finish this degree until I'm 50? However, I did think of your fine man while doing do. Perhaps I can blame you? My dad makes the most amazing egg nog ever. It's custardy, nutmeggy, rummy delicious. I can take or leave the commercial stuff, but the divine pitcher that lives in their fridge at Christmas? NOM. 1. i LOVE eggnog. not the alcohol-y versions -- give me the thick and creamy, oh-so-smooth, only-comes-at-christmas (and apparently now at easter, in pastel-colored cartons?) lite-milkshake-textured deliciousness. LOVE it. 4. alas, i am also experiencing the crunch of desperation and holiday cheer that is winter finals (only, i'm the student). i'm sorry. =/ it's not fun, i know. I find eggnog disgusting, no second taste necessary. My mother makes a delicious fruitcake. It's a Scottish thing. The Scots make a special fruitcake for weddings, even ((at least they did when my Mum was a younger woman). I must now harass her (ask nicely?) to make one! UGHHHHHHHHHHHHHH I hear you SO HARD about finals in December. Library is my life and I have no time at all to feel christmasy. Egg nog is fine, but I wouldn't go out of my way to drink it. OHMYGOSH, i think satan did create finals. definitely. and egg nog is good but i can only take it in small doses. in shot glass portions. p.s. seriously though, do jews drink egg nog? i asked my roommates this question and they just laughed. IDON'TUNDERSTAND. Darn you, now I have to go poor myself a glass of eggnog! (at 10 o'clock at night). My heart goes out to you in this, your ninth final season. It's a real pisser. I know. And lastly, my husbear and I got to the bottom of the fruitcake rumors. We made our own last year. It's all true. It's awful. Of course we made the traditional recipe wherein you douse the cake everyday for like a month in hard liquor. You know, for the sake of staying true to the experiment. Maybe if the cake wasn't pickled in liquid that tastes like gasoline it might be good. But not bloody likely. So glad to read I'm not the only person who hates the nog! Gleck. I have tried fruitcake, to be polite - never had a good one. One year, in a smallish circle of friends, a lovely wrapped fruitcake made the rounds (no one wanted it and it kept getting re-gifted) and we ended up with it so I gave it to my mother in law, who loves the stuff. i like eggnog with chai. it's delicious. it's really not my favorite thing ever. fruitcake is gummy and chewy and it reminds me of old people in the way that my great grandmother always used to send us a fruitcake at Christmas time. and also, did you know that fruitcake used to be the topper on wedding cakes? the bride and groom would freeze it to eat on the one year anniversary of their wedding. kind of neat- but too bad it was fruitcake. however, i do suggest that you don't rely on this natalie from moscow's opinion and try your own slice of fruitcake because wonder of wonders you could actually like it! Australians aren't that big on egg nog but we are big on fruit cake. And I have one word for it....NASTY! Keep your taste buds pure and stay away from the fruit cake. Nice to see other people share my eggnog views. Thank you all, and now let's get some apple cider NOW to rid our minds of the remembrance of tasting something so vile. Fruitcake? Don't like. I think there may be something wrong with me, since there are lots of holiday foods I'm just not keen on. Ah well. Egg nog? LOVE IT! Particularly the soy kind, because I'm lactose-intolerant and all. Fruitcake, however, is nasty. Just plain gross. My great-grandma used to LOVE it, though. Finals week is this week for me, and I am in total agreement that it WAS Satan who invented finals week! Six classes worth of finals/final projects/term papers AND a busy retail job is so much for one person to balance! Also, I love your perceived Jewishness. My dad was Jewish, and then he converted to Christian before I was born. So I know nothing of being Jewish, and I feel robbed of my heritage. Plus technically, for one to truly be Jewish, I think their mom must be Jewish? I don't know. But I think I need to explore the Jewish side of me. It's like I miss it, and I don't even know it. i've never had egg nog (could never bring myself to try it), but fruitcake isn't as bad as everyone makes it out to be. my dad LOVES fruitcake. it's his favorite part of the season. i feel the pain a law school finals month can give a loving wife. we just finished last may. this december, i am finding myself feeling like something is amiss... am i missing the agony and stress of finals?!?! i hope not! ps-- i a haven't had eggnog since i was little. didn't like it then, but i think i will try it again. fruitcake = the devil's plan for indigestion. Fruitcake is REALLY good, especially in England where it is a Christmas staple. But, if you're wanting to try it, please make sure it's a super good one as there are some stinkers out there and I wouldn't want you to be put off. I have never in my whole life even tasted egg nog. I can't get past the thought of it or the way it looks. Perhaps this will be the year. "And this...THIS is for Nat!" As for Eggnog I LOVE it, I would drink it year round if the stores carried it! My husbands family makes their own, it's to die for but I've never been able to make it right myself. My Grandfather loves fruitcake. I think it's nasty only because I don't like cooked fruit in anything! I can totally see why people ask if your Jewish. It's hard to explain but the coloring/eyes make me think so. I get the same thing but I have a few in my tree so it makes sense for me. Hanukkah is spelled two ways because the H sound at the start sounds much more like the German CH (Yiddish). Now if general America would start saying it that way. I guess Bach rolls over in his grave quite often for the same reason. One time, in Futurama, they used fruitcake as a nuclear weapon. I don't think that's a good sign. Also, eggnog is amazing. Once upon a time I was done with holiday finals forever, then I started teaching at the University level. "HA!" said the Universe. My husband loves fruitcake, and all of the nation's unloved regifted fruitcakes end up here, then in his belly. I like eggnog, but only with the alcohol in it. And do you know what I saw at Super Target yesterday? Holiday milk...it's red. Geeeeeross. I absolutely adore egg nog. Secondly, I once had Vietnamese fruitcake (not really sure if there is much of a difference between Vietnamese fruitcake or regular fruitcake) but I definitely don't have fond memories of it. Yep, the egg nog is polarizing. I loathe it entirely. Something about it burns my tongue upon contact. What is a nog anyway? But I loooove fruitcake. I slice it, oh, 1/2 inch thick, schmear (a Yiddish term) with a slather of butter, then slide it under the broiler until it's HOT (and bubbly), then I eat it with a fork (since it is thence too hot to handle) whilst sipping some thick and chill 'nog. THEM'S the holidays. Love eggnog. Sometimes when I'm feeling especially like I want double the hips I already have, I put it in my hot chocolate. Hate fruitcake. Yucky candied fruit. The Italians have a cake called Panettone that also has candied fruit, but it's suspended in a light, fluffy bread, but I still don't really like it. It's all about that weird fruit. Pandoro, on the other hand, (if you can find it) is WONDERFUL. It hails from Verona and even comes with powdered sugar to put on top and shake around in the bag. Make sure to eat it with ice cream (gelato if you can get it) or hot chocolate (with eggnog if you want more hips) or both! Do you know, one year I lost weight over the holidays? There should be a new holiday celebrating that miracle. NO EGG NOG. Not now. Not ever. But my husband also loves to chase his with Twizzlers and I don't know anyone else who does that, so it's comforting to know he's not alone. Love the nog with a little grog (whiskey or rum) and I think if you were Jewish you could find some kosher-nog, yes? I met eggnog last year and found it delightful!!! With a dash of nutmeg of course. I am normally not the posting comments type, because I am extremely shy and tend not to give opinions unless I am just really opinionated that hour. Given that, I just had to say thank you for bringing the old Natalie back! I know you've been super busy with moving, redecorating, and of course Henry and his demanding stomach (I know because I had a baby girl three weeks ago who is also a milk monster), but I had been thinking your posts of late had been short and concise, truthfully kind of lost feeling...most likely due to all the new distractions in your life :) However, this post reminded me of the old you, who would wonder with your thoughts as you wrote, pose questions and make jokes...I just love reading your blog! So a special thanks and welcome back (don't know if you've been feeling this distracted path as well...please don't take offense in my noticing). Eggnog is the most heavenly awesome beverage...EVER! I wish we were allowed to consume it all year long, but seeing as it has a bazillion calories in every sip and readily contributes to the Thanksgiving/Christmas bulge, I can only partake in my enjoyment of it during the charming days between Thanksgiving and New Years. Once January 2nd hits, it's no more Mrs. Indulge Myself and bring back Mrs. Gym Cram Sessions till summer bikini season! As for fruitcake...I must admit I have been scared off by the nay-sayers from ever trying it, but I have pondered making one myself just to test it out. With a new baby this holiday, I doubt I'll get around to doing that project, but when I do I'll march right back here and tell you all about it! the most excited i have been this december: drinking an eggnog milkshake from mcdonalds. it was bliss. it was wonder. it was everything i've ever dreamed of put into a waxed paper cup with a straw. it made me decide then and there to create an eggnog version of everything possible. tonight will be my attempt at eggnog frosting. also...i thought you were jewish? why did i think that? did i read this somewhere? I would love to write something in response to all the thought provoking questions that were posed, (no, I'm not making fun), but I just can't, just can not get over the Santa with the face beard! Really! They couldn't spring for a guy with a real beard? Where is their Christmas spirit? My boss asked me today, "Is your husband graduating on Saturday?" And I had to say, "Nope. ONE. MORE. SEMESTER." Which is exactly what I said LAST semester. So I feel your pain. And all I have to say is Nog it up! What else can we do? I think I'm one of the few people in this world who likes fruitcake. I can eat the candied "fruit" stuff, but it's much better when made with real dried fruit. My hero Martha Stewart did a recipe a few years ago where you store your cake for weeks and slowly douse it in rum. It sounded AWESOME but I'm totally not up for that kind of a commitment. As for eggnog - NASTY. The texture makes me gag. Like someone said above, I try it every year in the hope that it suddenly tastes good. Why do I do that? It's nuts. My mother in law makes an eggnog bunt cake that's pretty much to die for, though. So I guess, for me, it's not the flavor, it's the texture. Ugg... makes me gag just thinking about it. Every year I search the refrigerated shelves at the grocery store as the Thanksgiving and Christmas holidays creep closer. My husband laughs at my dedication to the eggnog, but I'm addicted. I pour myself one large, cold glass each day and slowly sip it down whilst lounging in a comfy chair. Oh the deliciousness. Thankfully, I am the only one in my family who likes it, so one carton lasts me through most of the season. Mmmmm. I have often had the same suspicions as you about the truthfulness of the fruitcake rumors, so when you addressed that concern in your post, I whole-heartedly nodded in agreement. I'm relieved to read in the comments that there are many who have tasted it first-hand and that the nastiness accounts have not be exaggerated. There's one ponderment that I can release from my mind. As a person who took five ridiculous finals this week I agree with not having them in December. Also I love egg nog. I like to sprinkle nutmeg on top. Delish! You have some really good ideas in this article "Christmas In New York part two ". I am glad I read this. I agree with much of what you state in this article. Your information is thought-provoking, interesting and well-written. Thank you.